But, somehow it doesn’t seem right to *just* eat dumplings for dinner. I like a big hit of veggies. Especially on a weeknight. I admit it. I’m kind of boring like that. Well enter the incredible YTGT dumpling stir fry. 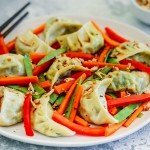 It’s everything I love about dumplings, but with a good serve of just cooked (still a little bit crunchy, just how I like them) veg, coated in a flavour packed, easy to make, stir fry sauce. This recipe is seriously simple and super yum. And, once you go there, you will be like, WHOA! Why aren’t we ALL eating dumpling stir fries, ALL the time?? No one ever turns their nose up at eating this, cos dumplings. Pork, chicken, prawn, veggie – steamed, boiled, fried – you can do dumpling stir fry any which way you like it. Just in case you didn’t know…gluten free dumplings exist. Not even kidding. Easy. One Pan. Total weeknight dinner trifecta. Okay so now, you’re convinced you need a dumpling stir fry for dinner, I bet your asking…where do I even buy dumplings? Well, fellow dumpling lovers. It’s officially the BEST time to be alive. You, my friends, can pick up frozen dumplings from your local supermarket. I’m talking, loaded with fresh ingredients, homemade, yummy dumplings right there in the freezer case. I know, right? Blew my mind. Changed my life. If you’re an Aussie look out for, Mr Chens (including their gluten free range). They are my fav. Now, just putting it out there. If you would like to invite me over for a dumpling stir fry, I would probably say yes? I like them pan fried with crispy bottoms. Just so you know. How do you like your dumplings? 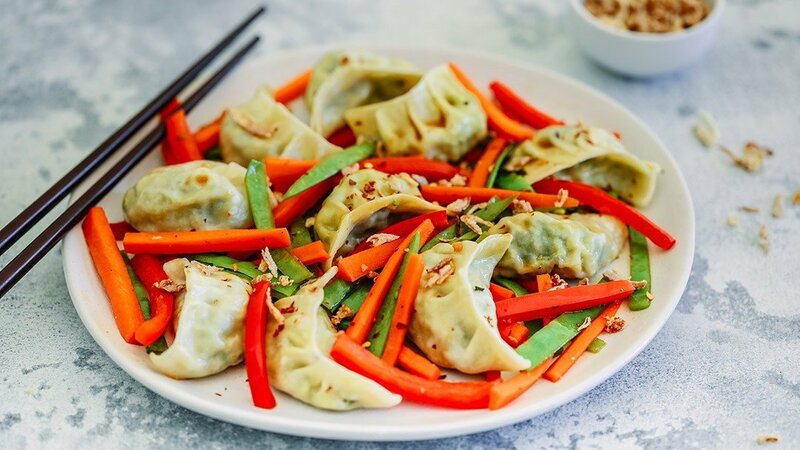 Think fat juicy dumplings, lightly pan fried with fresh veg, and a flavour packed sauce. This is not your average stir fry. It will actually change your life. 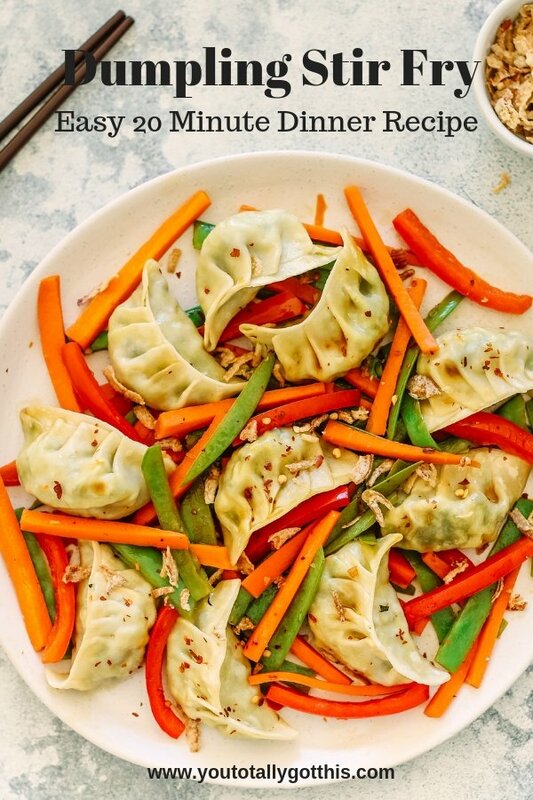 Got your hands on some gluten free dumplings? Just use tamari instead of soy sauce and wal-ah! Gluten free dumpling stir fry. Pure magic. If you prefer boiled or steamed dumplings, go for it. Just follow the directions on the pack to cook your dumplings any which way. 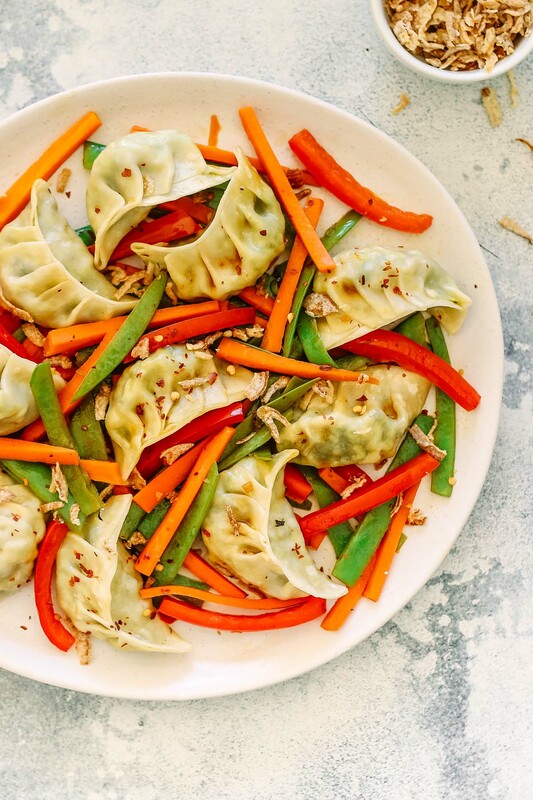 P.S – Want a whole weeks worth of dinners just like this awesome Dumpling Stir Fry? Grab your FREE quick and easy weeknight dinner plan right here.